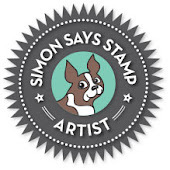 Simon Says Stamp Store Blog where the blog hop begins. With my card I wanted to show how perfect the dies are to accompany sweet Tilda. I have die cut the trees, the sun, and the large butterfly and then coloured them with copics as I always think colouring die cuts really helps to add some depth and makes them "pop". I'll pop back later and add the copic colours, I'm having computer problems & wanted to get the important info and my post scheduled while I could. There are so many gorgeous products to play with in this release, there is definitely something for everyone no matter if you are a crafter who likes CAS cards or of like me you are a fan of sweet images and lots of embellies. My absolute favourites have to be the butterflies they are so pretty. What's your favourite? 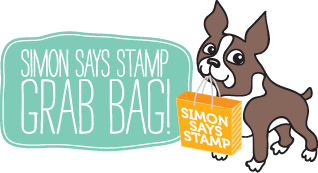 Our lovely Heidi is very generously giving away a Simon Says Stamp grab bag containing stamps, papers & embellies to a random commentator on each blog so be sure to leave a comment peeps. Love the detail you put into this card...it is gorgeous! oh wow... what an lovely card..
the very very thin leaves ar wonderful. It´s an very very lovely card. So pretty! I love how you used the sunshine and tree dies to make the scene! GORGEOUS card, Mandy!! Love the trees! WOW! The detail on your card is absolutely AMAZING! Just beautiful! LOVE your card and how you used the dies to build a beautiful BG!! TFS! Love your use of the dies, and your coloring of sweet little Tilda is phenomenal. What a pretty little scene you have created with so many beautiful elements. Love these new butterfly dies. Wonderful card. You obviously put a lot of time and talent into its creation. I especially love the Leanna butterfly--and your card is simply gorgeous with all of the detail you have added. Thanks for sharing your talent! Such a charming and delightful card, Mandy! Gorgeous card, the coloured die cuts are fab! This card is just adorable! Love the little scene! Wow! This is way too cute! Your coloring is perfect! A wonderful card! Adorable! Love your use of the Sunrays! Your card is so creative. Love it!! love the card the tree and butterflies dies are ace and Tilda is so cute coloured to perfection and as always your card is fab. Such a sweet little card. Love how you assembled all of your components. Thanks for sharing. Amazing how you've worked those dies into the scene! Tilda is so cute. You really made a pretty setting for her. Such a fun scene you've created. Fantastic card! Love all the pieces you used. It's quite a beautiful scene. Wow, very details and so sweet! thanks Mandy for sharing - love the cards - the detail.. thanks for sharing your ideas. Great trees and beautiful butterflies! Beautiful simply beautiful colouring on those dies. I love how delicate look those trees! Great use of the new SSS stamps and dies. This is a beautiful card, I love all the detail. You can see how much love you put into it by looking at it. Thank you for sharing. I already ordered the "be" and "happy" stamps with dies, can't wait! Now I love the tree die! Your card is a work of art! Thanks for sharing you creativity with us! Beautiful card. Such intricate details. Adorable, absolutely adorable!!! Love your use of the dies to create a scene for this sweet Tilda image. Sweet Tilda looks so cute nestled in front of the rays of sunshine and those tree dies are fabulous. Beautiful card! This card is so so cute!!! Lovely card,Mandy!You are so creative!!! Amazing card!! Tons of gorgeous details!! Cute card! Those trees look fabulous with the added colour. Such a whimsical, lovely card. Isn't it amazing what clever girls can do. While this is beyond my card creativity, I love the tree die and look forward to using it. Thanks for sharing. Wow I love how you made a scene with all those dies! Gorgeous card! I love all of the details! The dies are the perfect touch to your little Tilda! Great job! Your coloring is beyond stunning and the card is a mini work of art! Love it! Really beautiful card. Thank you for sharing your talent. Love all the detail on your card. Beautiful! I love the coloring of the dies, they do really POP! Amazing way to add the different products into the same card, amazing inspiration! Thanks so much for sharing! Fabulous!! Great use of so many of the new die cuts and had fun trying to find them all on the card. Thanks for sharing. A very sweet card, love the scenary you created. Wow Mandy! Love your card. The die cuts definitely pop. I love how the dies are so versatile and you can use them to enhance any card making style! What a great card!!! And I'm in love with those butterfly dies! What a cute card, I just love the Tree die, it's going on my wish list. Thanks for sharing! AMAZING coloring!! Looks beautiful! I love your card idea! Wow... Completely adorable. And all of your details are amazing. Lovely way to use all the dies. I love it. OMGosh, your card is absolutely charming! I love all of your details and how beautifully you colored Tilda! What a lovely way to send "Hugs" to someone you love!!! Love your card with Tilda! Gorgeous card! Love all the fabulous detail with this sweet image! Wow..beautiful coloring. Such a pretty card! Wow, this card is so beautiful, so many gorgeous details, love how you showcased the tree die, simply stunning!! Wow so much details! I love it! thanks for the chance! Beautiful card!!! I love how you made a scene with the trees, sunshine, and butterfly dies!! And they do go very well with Tilda!!! Very pretty card!! Thanks for sharing!! Oh my goodness--LOVE LOVE LOVE what you did! How creative and beautiful--it draws me in! Thank you for sharing and showing different ways to use SSS dies! Love all the layers on the card. Your card is very pretty...nice work! When I started the blog, SSS asked me what my favorite new release was, and I said the "All Seasons Tree Die". I'm still calling it my favorite, especially after seeing what a gorgeous card you made using that very die. I love everything about your card, Tilda, the sun, trees, etc. Thank you SSS for giving us the chance to win! What a lovely card!! You sure are talented!!! So beautiful! I love how you used the die cuts. Your Tilda image is so cute! OH MY!!!! Very beautiful card. Thank you for sharing this!!!!!! Very cute Mandy . Thank you for sharing. I love that you were able to use so many of the new products in your card design! So much fun detail. Cute card! OMGosh! The trees are wonderful, I'm going to haveto order those, too! Oh my, this is so adorable. I love the sun rays and that sweet little image. Your coloring and the way you set up the scene is fabulous! What a lovely way to use those dies in your layout. Beautiful card! I love the idea of coloring die cuts. I does make them pop! Wow, your colouring is fabulous! So is your card. Mandy just stunning as always!!!!! i just love those dies too i think the floral one's are my fav! although i would buy them all if allowed! This card is stunning! Love the coloring. 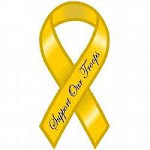 Thanks so much for sharing this. this is too cute--love your design. Oh my.... Your card is absolutely GORGEOUS!!! Oh how lovely, Mandy! Awesome creativity! Thanks for the inspiration! Eager to place an order with SSS! Fantastic card! Love the little girl and the trees are brilliant! Gorgeous card, the trees add such dimension. Gorgeous card. Love how you used the dies and did the coloring. Amazing! I love your style! Love these newbies! Such a complex and cute design! Well done. A gorgeous card. I love the die cuts. You're card is absolutely amazing. So beautiful. Thank you for sharing it. I just love all the new products, dies and stamps. My fav, which is hard to pick would be the word dies and stamps. What a beautiful card! Tilda as always is adorable and your coloring amazing! I love the trees and sunshine. Oh my! That card is amazing... very beautiful. My wish list is growing. Oh, this card is adorable. Love that little girl and the die cut trees! You colored everything just perfectly! All of these new SSS products are great and so is your card. What a gorgeously detailed creation! Very cool card!! So much fun looking at all the different details:) Thank you for sharing!! Cute! So many details too! What a unique and beautiful card! I like how you used the sunshine die for the background! Thanks for sharing! Honestly, Tilda-cards never really caught me, but these are somehow different from those I used to see around. I like it :) Very well done. Wow- so many details. It is so pretty I love it! WOW what a beautiful card!! This is an amazing card!!!!!! Looks like a scene out of a movie..
Love all the elements on it..
Wow! So many beautiful details! Cute card - these die cuts are so versatile, they work with EVERY style - LOVE! Wow what a beautiful card. How do you even send something so gorgeous. I am always afraid the recipient will throw them away. I would have to frame this card for my wall. You have an amazing talent. thanks for sharing. Oooh, I love how you used all the different dies! Such a wonderful scene! WOW!! So many elements! Stunning!! This is really sweet and I love the coloring. The die cuts add such a great touch and create a wonderful little scene! Cute card to give to my little nieces! I love how you created this, so much to look at and love, thank you for sharing! OMGee love that tree! I just had an order for a tree project and couldn't find a tree I liked. Now I have. Love how you built the scene around that tree! 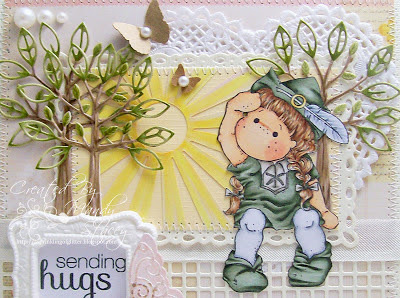 Those trees you've created look so amazing with this sweet Tilda, and I love the sunshine die you placed behind her! Gorgeous coloring! Love the trees and the butterfly! You made everything work together so nicely. Great card! Wow, just so adorable! Love how you've used the die cuts on this card! Mandy, what a perfect Tilda card!! The tree is magnificent!! Beautiful card - love all the details. Thanks for sharing! Cute card. I love the new stamps and dies. what a great little scene you created. Cute card. I'm loving the new stamps and dies. Such a sweet scene! Fantastic use of the dies, especially loving the detail in the trees!